MBARARA- Following the numerous attempts by some of Mbarara Municipal officials led by town clerk Edward Lwanga to sell some of the prime plots belonging to Mbarara Municipality, the Inspector General of Government, Irene Mulyagonja wrote to Lwanga ordering him to cease any subdivision, registration and sell of any plots. Sources at the municipal council have revealed to this website that the move to sell some of the plots like Kakyera land has been orchestrated and championed by Lwanga and the executive committee led by Mayor Robert Kakyebezi. 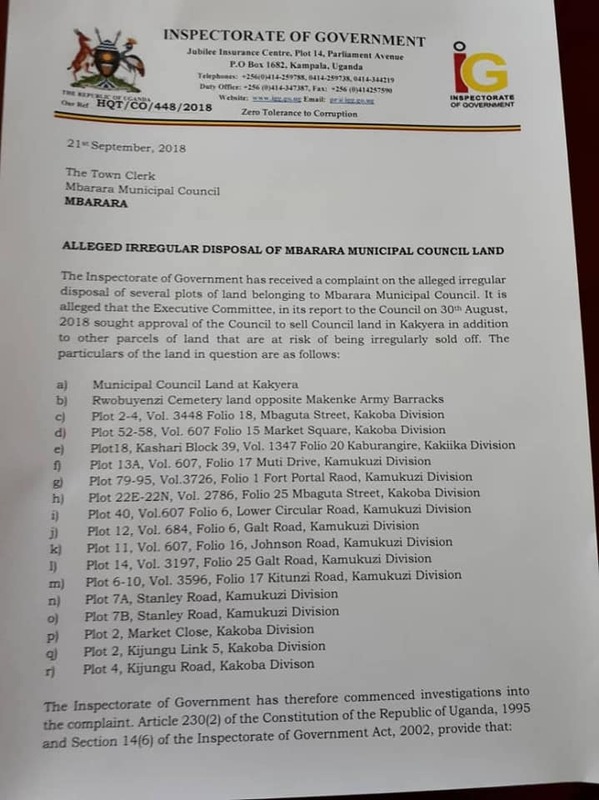 According to the report of the executive committee to the council on August 30, 2018, sought approval from council to sell Kakyera land and other parcels of land which are at risk of being sold off irregularly to buy garbage trucks; which a section of councilors have vehemently rejected. This prompted one of the whistleblowers led by Michael Tusiime the Mbarara Municipality Member of Parliament to petition the inspectorate of government seeking for its immediate intervention. In his letter to the auditor general through the permanent secretary and secretary to the Treasury Keith Muhakanizi, Tumusiimeasked to have a special audit of Mbarara Municipal council operations and service delivery activities from FY 2014/2015 to date. According to the letter from F. Mariam Wangadya, the deputy Inspector General of Government dated August 21, 2018, highlights the sum of prime plots which are being irregularly disposed off by municipal officials. These plots include Municipal land at Kakyera, Rwobuyenje cementry land opposite Makenke Army Barracks, Plot 2-4, volume 3448 folio 18, Mbaguta street, Plot 52-56 vol. 607, folio 15 Markert Square Kakoba Division, Plot 18 Kashari block 39 Vol.1347 folio 20 Kaburangire in Kakika division, Plot 13A vol.607 folio 17 Muti drive Kamukuzi division, Plot 79-95 Vol. 3716 folio 1 fort portal road in Kamukuzi division, Plot 22E-22N Vol. 2786 folio 25 Mbaguta street in Kakoba division, plot 40 Vol. 607 folio 6 lower circular Kamukuzi division, plot 12 Vol 684 folio 6 galt road in Kamukuzi, plot 6-10 Vol. 3596 Folio17 Kitunzi road in Kamukuzi division, Plot7A Stanely road Kamukuzi division, Plot 7B Stanely road, Plot 2 market close Kakoba division, Plot 2 Kijungu link 5 kakoba division, plot 4 kijungu road Kakoba division. The letter says the inspectorate of government has commenced investigations into complaint as it’s enshrined in the 230(2) of the constitution of Uganda and section 14(6) of the Inspectorate of the government Act 2002. 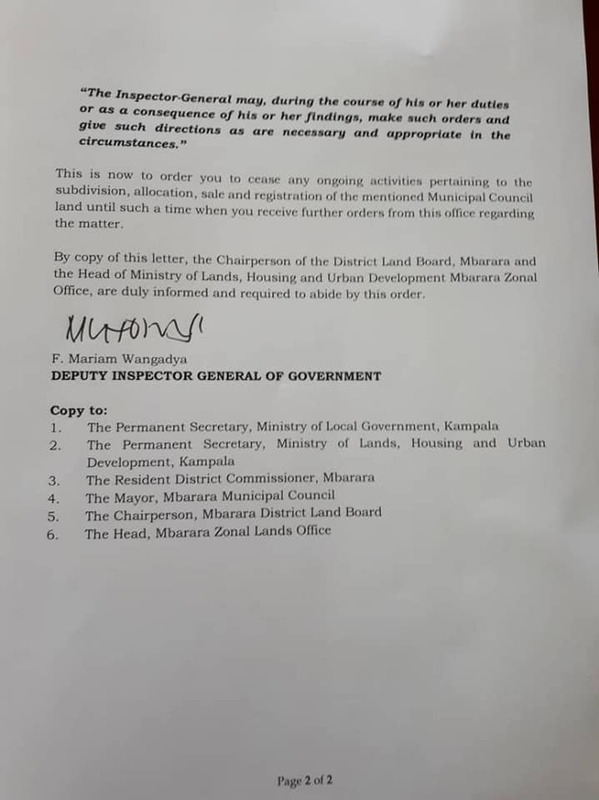 “This is now to order you to cease any on-going activity pertaining to the subdivision, allocation and registration of the above mentioned municipal land until such a time when you receive such orders from this office on the same matter by copy of this letter, the chairman district land board Mbarara and the head of ministry lands, housing and Urban development zonal office Mbarara are required to abide by this order,” the order reads in part. Edward Lwanga confirmed receipt of the IGG’s letter and that on Kakyera land told new vision that they wanted to sell part of the land to buy garbage trucks since the council has no sufficient trucks to collect garbage in town. In the same vain council meeting held last week, the speaker of Mbarara Municipality, Bonny Tashobya Karusya instituted an adhoc committee of nine councilors to investigate the alleged sell of municipal parcels of land and this committee is to give a report of the findings in one week. The members include led by Mugasi Naboth and Doreen Natamba as the vice chairperson, others are Robert Bushweta, Godfrey Kansime, Asimwe Ntengye, Betty Tigefera, Imelda Nyamwija, David Nahurira, and Imam Kagiko. We have learnt that prior to the formation of an Adhoc committee, councilors had moved to censor all members of the executive committee led by mayor Kakyebezi and his deputy but this was halted by the speaker saying that councilors should first wait for the report of the Adhoc committee. “As the IGG also makes his own investigations for us as the council we also want to come up with our own investigations and whoever is found to have participated in the sale of any plot will be answerable” Imam Kagiko, one of the councilors on the committee noted.